A few weeks ago, I was browsing the shelves at Goodwill when a wave of sadness came off a familiar yellow spine. 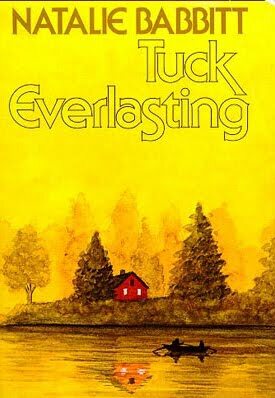 It was Tuck Everlasting, which I had read as a child, fairly soon after I came to America. It was the same edition, with the same misty watercolor on its cover. A student (the front cover identifies her as Tatjana) had been through the little novel already, circling vocabulary words and identifying similes and metaphors. Her resolution petered out around page fifty; I like to think that she started enjoying the book at this point. The little I could remember from childhood: there was a family that drank from a spring in the woods and became immortal. I couldn't bring back anything else or place the source of that sadness. A glance at a few pages indicated, though, that the prose was worthy of adult respect. Here is a character sketch of the mysterious stranger that comes to town: "His tall body moved continuously; a foot tapped, a shoulder twitched. And it moved in angles, rather jerkily. But at the same time he had a kind of grace, like a well-handled marionette." She was surprised years later to find that her mother had kept a lot of the writings they had done, the drawings and the models, the chronologies and the maps. Most of the work was Ben's, which was maybe why she had kept it. When Kit took it all from the cardboard box, she felt a strange vertigo: she recognized and remembered these things and at the same time saw them shrivel and shrink; what had once been big and vivid to her became small, and not only in size. He had done it all on little pieces of shoddy paper, in colored pencils; he had been just a child. It was like picking up the body of a bird, and being surprised to find it nearly weightless. What a pleasure, then, to feel none of this vertigo in the first few chapters of Tuck Everlasting, but instead writing of enduring charm and beauty. One of the wonderful things about childhood -- I remember very faintly -- is a sense that everything is alive and can be communicated with: animals and plants, houses and roads. And one can see this sense of the world in Tuck Everlasting, as well as most books that speak to children. In the first few pages of the novel, the grass is described as cut "painfully to the quick" (how many adults would consider the suffering of cut grass? ); the house where our heroine Winnie lives "was so proud of itself that you wanted to make a lot of noise as you passed, and maybe even throw a rock or two"; and the wood where the spring is hidden "had a sleeping, otherworldly appearance that made you want to speak in whispers." Winnie is a lonely ten-year-old. Most of the time, she only has a toad for company (the toad, as one would expect in such a book, seems to be able to understand much of what Winnie says). One day, Winnie decides to explore the wood, which her family owns, and she comes across a beautiful boy, Jesse Tuck, drinking from a spring by an oak tree. She wants a drink too, but he won't let her, and she becomes understandably curious about why. When the rest of the Tucks come to meet their son, they realize that the little girl might be a problem for them, and they grab her and take her to their house. There, they try to explain their situation -- how they drank accidentally from the spring once almost a century ago and have been alive ever since, unable to age or even get hurt, moving from place to place to avoid scrutiny. Angus, the wise and gentle father, tries to convince Winnie that no one else should ever know about the spring. There is a lovely conversation about the continuous flow of water in the pond, and how the Tucks have somehow been removed from this cycle. Soon after this point, though, an adult reader begins to feel that this is indeed a book for children. A stagy plot gets underway involving a man who wants to sell the spring water. The plot moves rapidly in three- to four-page chapters, with virtually no summary narration; it's one tiny scene after another, a kind of eternal present that felt thin and rushed. The whole action of the book, including an unexpected act of violence and a late-night jailbreak, takes place in about two days. Here is "a kid's review" from Amazon: "I read 'Tuck Everlasting' in sixth grade, and while reading it, noticed that it lacked the basic elements of a good book. The first thing I noticed that the book seemed to be -if I may- condensed." Indeed you may, junior reviewer and sophisticate-in-training! Thankfully I had no such complaints when I was young; my imagination filled in whatever might be missing and turned a pencil sketch into a painting. As an adult, though, I was beginning to feel the shrinking that Crowley describes. I couldn't believe anymore that so much would hinge on Winnie, or that people would consider her quite so important. I was still glad I read the book, but felt like it belonged to my past. Then I came to the Epilogue. It takes place many years after the main action of the book, and involves a choice that was presented to Winnie as a child. The Epilogue is only six pages long, but it transforms everything that has come before. It's an absolutely beautiful piece of writing, not just for children but for anyone. Here, as I read, I understood the wave of sadness that came off the book when I first picked it off the shelf. The end was still thought-provoking, still powerful. So, perhaps the bird is light in one's hand at times, but it does wake up and fly again. It was nice to discover that my reaction as a child was authentic and lasting, and more to be trusted than my taste as an adolescent (most of my high school favorites, like Catch-22, I've never been able to finish again). I think most adults, even ones who didn't love this book as a child, would find the novel worth reading by the end. It is a lovely fable, and its resonance only grows, I think, once one has become more closely acquainted with death.